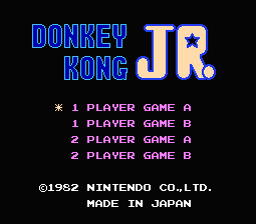 Play Donkey Kong Jr. Now! Mario(Jump Man) has captured Donkey Kong, leaving Donkey Kong Jr. without his daddy. It's time for some Donkey Kong vengeance! The re-release of Donkey Kong Jr. for the Nintendo offered better graphics, sound and controls, since everything was pretty primitive on the Atari 2600. Just like before you must save your dad, Donkey Kong, from the evil Mario who is holding him captive. Guide Donkey Kong Jr. through the level to Donkey Kong's cage with his climbing and jumping skills! When climbing up, you go faster if you are holding on to two vines, while going down goes faster when you are on only one. To kill enemies, you'll have to get them underneath a piece of fruit, touch the fruit and it will fall down. If it hits the enemy they'll die and you will get some points. If you want a really high score, jump over enemies every chance you get.